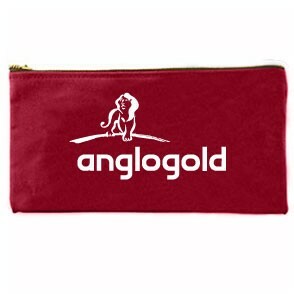 Perfect for travel or for carrying chargers, earphones, makeup, coins, keys, credit cards and cash. Made in the USA! Standard Coin Bag 5"W x 3" Made of durable scuba foam material, that stretches for maximum capacity and keeps items protected from moisture, with black nylon zipper, black chain stitching & seamed bottom. 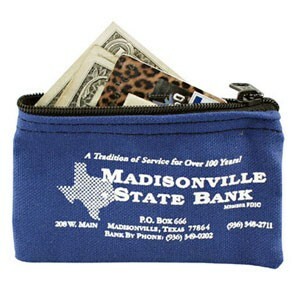 American made zippered coin / money bag is a great carry all for cash, coins, credit cards, identification, keys & more. Made in the USA! 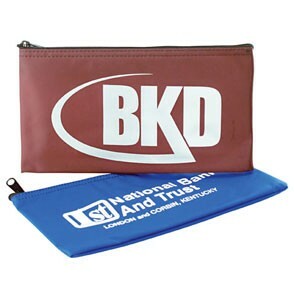 Standard Deposit Bag & Organizer. 10-1/2"W x 5-1/2" Made of nyloglo material with black nylon zipper, black chain stitching & seamed bottom. 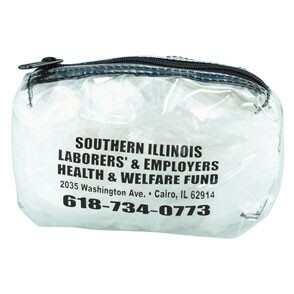 American made bank bag for legal documents, cash, payroll checks, mini catalogs, office supplies and more. 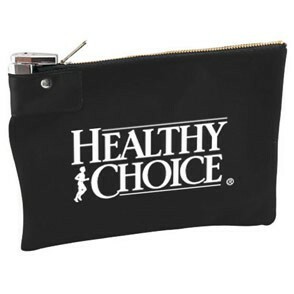 This zippered bag is a great carry all for cash, money, coins, credit cards, checks, cash drawer contents & more. Made in the USA! Deluxe Deposit Bag & Organizer. 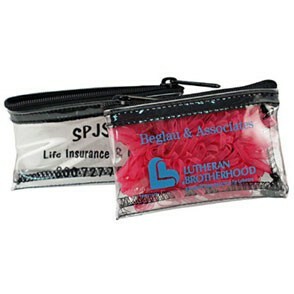 11-1/2"W x 6" Made of nyloglo material with black brass zipper, lock stitching matched to the bag color & seamless bottom. 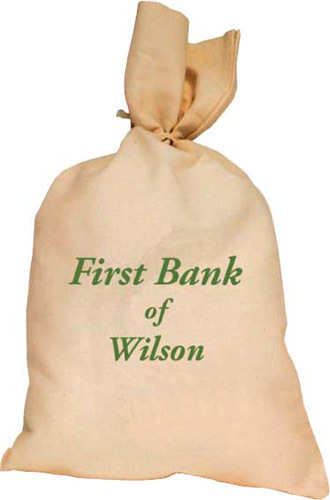 American made bank bag for legal documents, cash, money, coins, payroll checks, mini catalogs, office supplies and more. 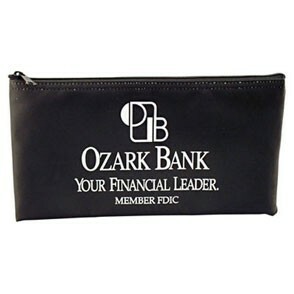 This zippered bag is a great carry all for cash, coins, credit cards, checks, cash drawer contents & more. Made in the USA! Standard Coin Bag 4-1/2"W x 2-1/2" Made of 10 gauge clear vinyl with black nylon zipper, black chain stitching & seamed bottom. American made coin that is a great carry all for cash, money, coins, credit cards, identification, keys & more. Made in the USA Coin Bag 5”W x 3” Sublimated - 4 color process imprint. Made of Open cell foam material (durable polyester covered scuba foam) black nylon zipper, black chain stitching & seamed bottom. 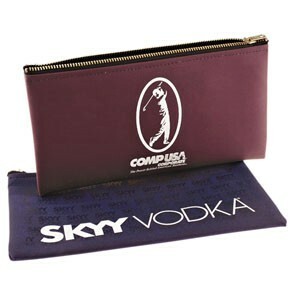 Upgrade your standard coin purse with 100% full color imprint coverage guaranteed to make your corporate image or local event more memorable. Great carry all for cash, money, coins, credit cards, personal identification, keys & more. Made in the USA! Standard Deposit Bag & Organizer. 10-1/2"W x 5-1/2" Made of durable scuba foam material, that stretches for maximum capacity and keeps items protected from moisture, with black nylon zipper, black chain stitching & seamed bottom. 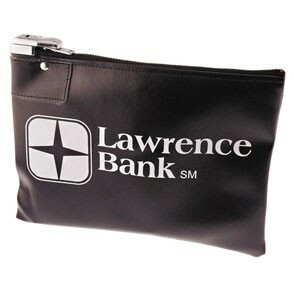 American made bank bag for legal documents, cash, money, coins, payroll checks, mini catalogs, and office supplies. 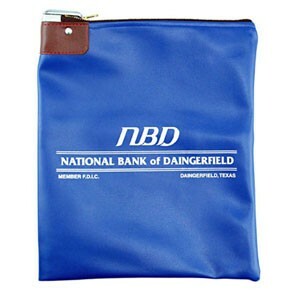 This zippered bag is a great carry all for cash, coins, credit cards, checks, cash drawer contents & more. Made in the USA! Tex-O-Leather vinyl Memorial Portfolio - 13"W x 10"with a black nylon zipper, black chain stitching & seamed bottom. This portfolio is great for carrying all your legal documents, financial documents, business reports, project plans or any important document to your next meeting. Large imprint area to maximize your advertising budget while displaying your company''s logo and message for all to see. Made in the USA! Deluxe Deposit Bag & Organizer. 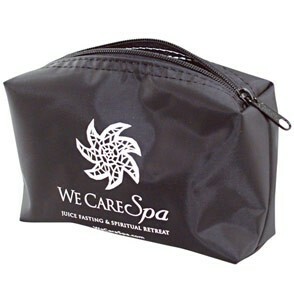 10-1/2"W x 5-1/2" Made of nyloglo material with black brass zipper, lock stitching matched to the bag color & seamless bottom. 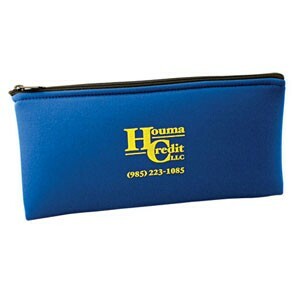 American made bank bag for legal documents, cash, payroll checks, mini catalogs, office supplies and more. 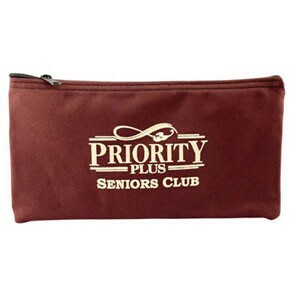 This zippered bag is a great carry all for cash, money, coins, credit cards, checks, cash drawer contents & more. Made in the USA! Tex-o-Leather vinyl Lock Bag 10-1/2”W x 12”. Bags include swing lock, 2 keys, black brass zipper, stitching to match fabric and seamed bottom. Transport and secure important possessions such as legal documents, checks, receipts, cash and other financial accessories. This bag features various options at additional costs. Please see standard features and options section. Made in the USA, 19 Gauge clear vinyl all purpose bag features black nylon zipper and black stitching and gusset bottom. 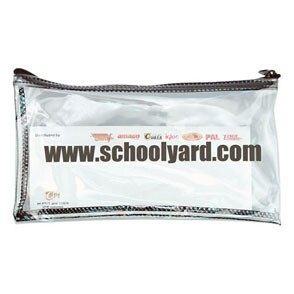 6”Wx4”x2” Transparent durable carry all bag great for cosmetics, overnight travel, medications, organizing office supplies, pens & pencils, arts and crafts, scrap booking supplies, golf accessories, tools & more. Advertise your business on this see through carry all utility handbag for maximum memorable exposure. Made in the USA! Standard Deposit Bag & Organizer. 11-1/2"W x 6" Made of 10 oz cotton canvas duck material with black nylon zipper, black chain stitching & seamed bottom. American made bank bag for legal documents, cash, payroll checks, mini catalogs, office supplies and more. 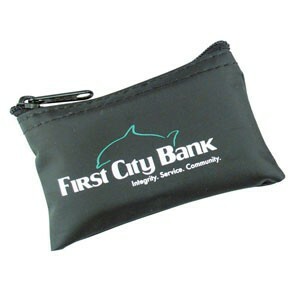 This zippered bag is a great carry all for cash, money, coins, credit cards, checks, cash drawer contents & more. Made in the USA! Tex-o-Leather vinyl Lock Bag 10-1/2”W x 7”. Bags include swing lock, 2 keys, black brass zipper, stitching to match fabric and seamed bottom. Transport and secure important possessions such as legal documents, checks, receipts, cash and other financial accessories. This bag features various options at additional costs. Please see standard features and options section. Made in the USA! Nyloglo Lock Bag 10-1/2”W x 7”. Bags include swing lock, 2 keys, black brass zipper, stitching to match fabric and seamed bottom. Transport and secure important possessions such as legal documents, checks, receipts, cash and other financial accessories. This bag features various options at additional costs. Please see standard features and options section. Made in the USA! Deluxe Deposit Bag & Organizer. 11-1/2"W x 6" Made of 10 oz cotton canvas duck material with black brass zipper, lock stitching matched to the bag color & seamless bottom. 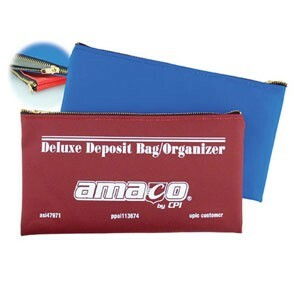 American made bank bag for legal documents, cash, money, coins, payroll checks, mini catalogs, office supplies and more. 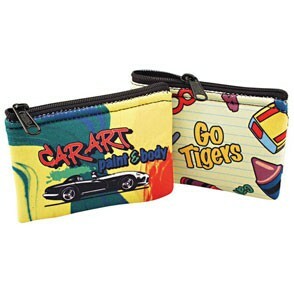 This zippered bag is a great carry all for cash, coins, credit cards, checks, cash drawer contents & more. Made in the USA! Standard Deposit Bag & Organizer. 11-1/2"W x 6" Made of nyloglo material with black nylon zipper, black chain stitching & seamed bottom. American made bank bag for legal documents, cash, payroll checks, mini catalogs, office supplies and more. 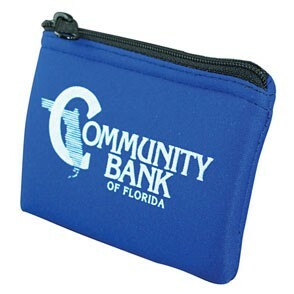 This zippered bag is a great carry all for cash, money, coins, credit cards, checks, cash drawer contents & more. Made in the USA, 70 denier nylon all purpose bag features black nylon zipper and black stitching and gusset bottom. 6”Wx4”x2” Durable carry all bag great for cosmetics, overnight travel, medications, organizing office supplies, pens & pencils, arts and crafts, scrap booking supplies, golf accessories, tools & more. 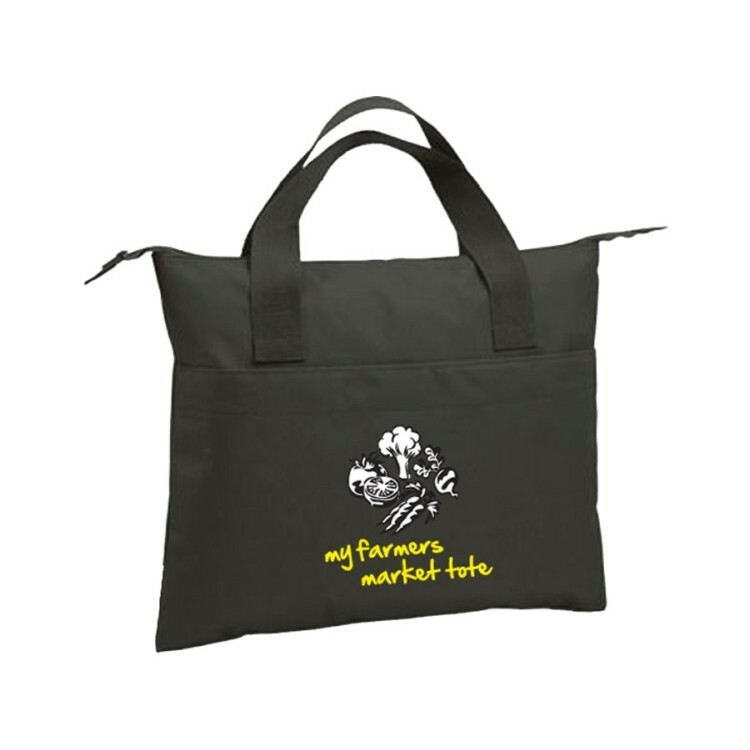 Advertise your business on this carry all utility handbag for maximum memorable exposure. 600 denier polyester with heavy vinyl backing. Features one large main zippered compartment, one front zippered pocket, and poly-web handle. Inquire for embroidery or 4 color process full color heat transfer. 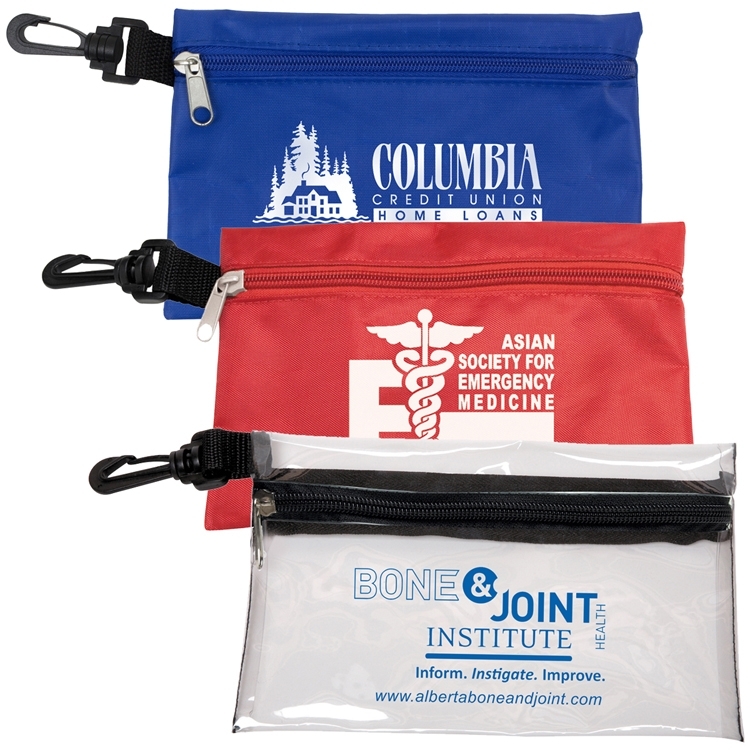 The Bank Bag is a great promotional product to impress your clients. This 12 1/2 inches x 19 1/2 inches is holds up to 10 oz. and features a natural colored background and is large enough to fit your money needs. 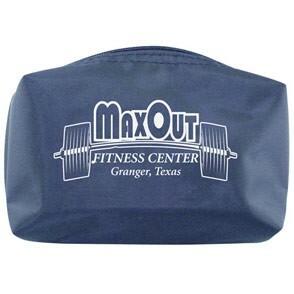 The bag has ample printing space for you to include a personal message or your company logo. 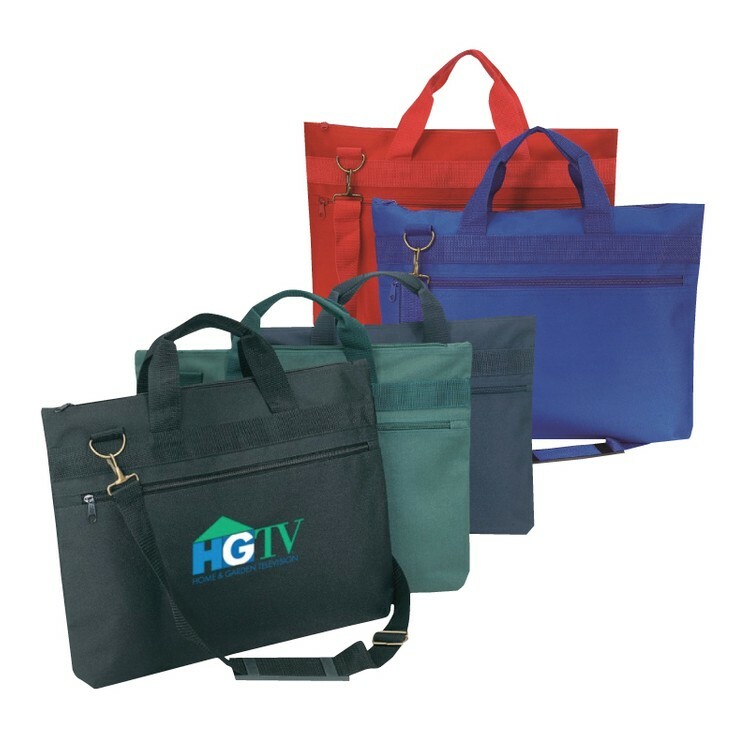 This Bank Bag is perfect for financial institutions, government offices, retail chains and much more! When You Don't Want To Take ALL Your Work Home! This bag combines a briefcase with a bank deposit bag! When you want to lighten your load, this is the choice. Banker briefcase, 600 Denier Polyester. Made with 50% Recycled material. 600D Poly blended with 50% Recycled material. Large front pocket for easy decoration as well as storage. Zippered main compartment. Side pocket. Made in the USA! Standard Coin Bag 5"W x 3" Made of 10 oz cotton canvas duck material with black nylon zipper, black chain stitching & seamed bottom. 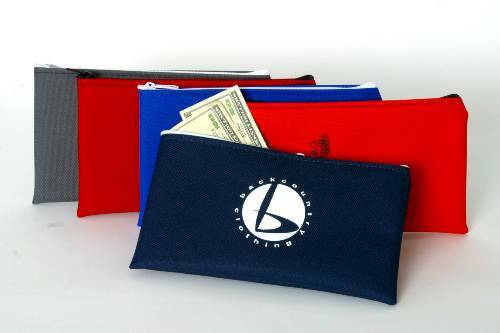 American made coin / money bag that is a great carry all for cash, coins, credit cards, identification, keys & more. Made in the USA! 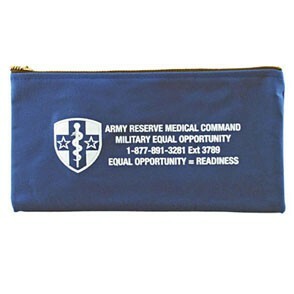 Standard Coin Bag 4-1/2"W x 2-1/2" Made of 70 denier material with black nylon zipper, black chain stitching & seamed bottom. American made coin that is a great carry all for cash, money, coins, credit cards, identification, keys & more. Made in the USA, 70 denier nylon all purpose bag features a black nylon zipper, black stitching, and gusset bottom. 8”Wx5”x2” Durable carry all bag great for cosmetics, overnight travel, medications, organizing office supplies, pens & pencils, arts and crafts, scrap booking supplies, golf accessories, tools & more. Advertise your business on this carry all utility handbag for maximum memorable exposure. 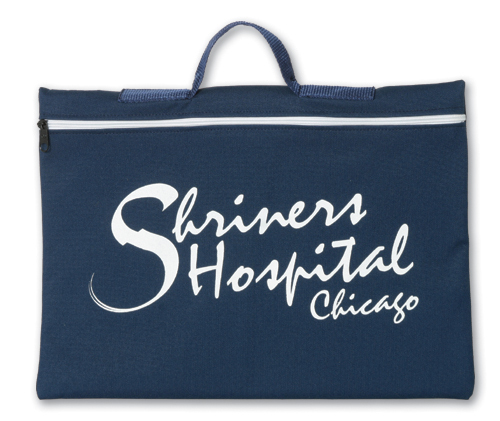 Made in the USA 600 denier polyester carry all deposit bag, 10-1/2"W x 5-1/2", with Sublimated - 4 color process front and black 600 denier back panel. Black zipper standard. Upgrade your ordinary bank bag with this full color front imprint guaranteed to make your corporate image or local event more memorable. American made bags for legal documents, cash, money, coins, payroll checks, office supplies, bank deposits, school crayons, pens, pencils & more. Made in the USA! Standard Deposit Bag & Organizer. 11-1/2"W x 6" Made of 10 gauge clear vinyl with black nylon zipper, black chain stitching & seamed bottom. American made bank bag for legal documents, cash, payroll checks, mini catalogs, office supplies and more. 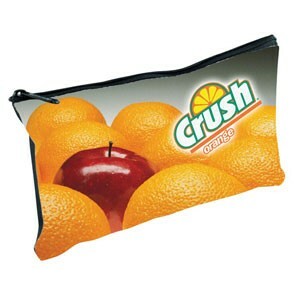 This zippered bag is a great carry all for cash, money, coins, credit cards, checks, cash drawer contents & more. Made in the USA! 18 oz Cotton Canvas Duck Material Lock Bag 10-1/2”W x 7”. Bags include swing lock, 2 keys, black brass zipper, stitching to match fabric and seamed bottom. Transport and secure important possessions such as legal documents, checks, receipts, cash and other financial accessories. This bag features various options at additional costs. Please see standard features and options section. Made in the USA! Standard Deposit Bag & Organizer. 10-1/2"W x 5-1/2" Made of 70 denier nylon material with black nylon zipper, black chain stitching & seamed bottom. American made bank bag for legal documents, cash, payroll checks, mini catalogs, office supplies and more. 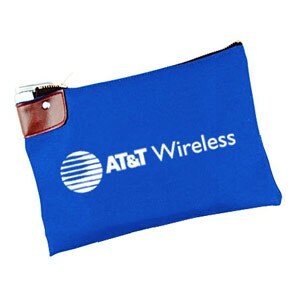 This zippered bag is a great carry all for cash, money, coins, credit cards, checks, cash drawer contents & more. Made in the USA! Deluxe Deposit Bag & Organizer. 10-1/2"W x 5-1/2" Made of 10 oz cotton canvas duck material with black brass zipper, lock stitching matched to the bag color & seamless bottom. 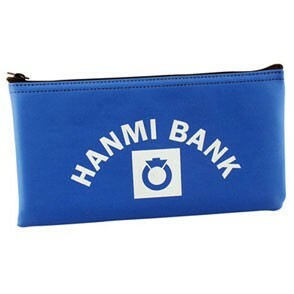 American made bank bag for legal documents, cash, money, coins, payroll checks, mini catalogs, office supplies and more. 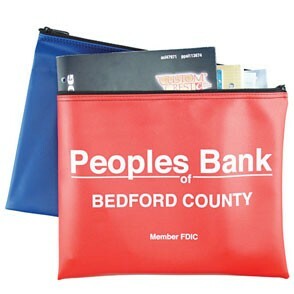 This zippered bag is a great carry all for cash, coins, credit cards, checks, cash drawer contents & more.